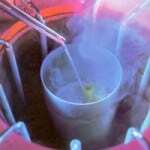 The egg freezing is to preserve eggs in liquid nitrogen, using a technique of cooling, can be stored for many years. The most appropriate technique and with a higher success rate is known as Vitrification, because this technique does not produce ice crystals at the time of solidification of eggs in ultra-cooling in liquid nitrogen, thereby promoting the transition to state solidification called glassy state (glass-like). To avoid freezing of embryos, patients who had surplus production (but 3 a 5 ova) of ova can “freezing the” for “thaw them” hereafter, getting new embryos in a second attempt to get pregnant. Patients who has such a family history of Menopause Early, and signs that may be present with familial risk. Patients who have no prospect of their offspring after 35 years old. We recommend natural pregnancy before 35 years. But, if there is no expectation of pregnancy before this time, can think about preserving some ova (would be an alternative exclusion, já natural alternative that is discarded). Frontally opposing what it conveys the media “Guaranteed fertility“. Patients with Chemotherapy or Radiotherapy. Egg freezing has existed since the late 90, with very low success rate was gravidez.Pois used the same technique (slow freezing) it uses the embryo, that was not appropriate paraóvulos. The breakthrough came with the advent of the new technique of vitrification. The first milestone of this técnicafoi with the emergence of techniques called vitrification or VitriIngá in Cryotop 2006 with high success rates. ( Although other techniques have appeared vitrification, with lower rates of success). The Word freeze, is implied by the formation of ice and vitrification technique does not form ice crystals , just when we use the words “freezing and thawing” erroneously written quotation, cientificamente some serious waves: vitrification and devitrification. Drug treatment to stimulate the development of multiple eggs until amuderecimento. The hormones are applied 8 a 14 days.Its function is to increase the production of eggs in the same menstrual cycle instead of just um.Geralmente some eggs do not reach an expected quality and why IVF requires multiple eggs to increase the chances of pregnancy. Control ovulatory series – This process utilizes the doctor ultrasound or blood test to measure the crescimento follicles, individualize the dose of drugs and to determine when the eggs are ready for removal. The success of egg freezing involves substances called cryoprotectants. These substances prevent the formation of ice crystals during “freeze”. The faster the process of egg vitrification best. The egg is inserted into liquid nitrogen to a temperature of-196C. The faster the process of egg vitrification, better, since its structure will be less altered embryonic. Cut up the frozen egg liquid nitrogen to (-196° C) and promotes heating (desvitrificação) meio using culture, until the total balance of temperature and dilution. Sperm sample is collected at collection of eggs. It takes place a selection of sperm, the most active are separated and added to a culture medium along with the eggs in the incubator. Eggs and sperm are prepared for fertilization. The eggs and sperm are injected by the method of micromanipulation, gametes where we introduced the sperm in the egg cytoplasm, with the aid of a micro needle under a microscope picture of fertilization is detected one day after. After the introduction of sperm fertilization is observed one day later and embryos, products that union, are maintained in culture medium in incubator for a few days. Usually three to five days after fertilization. Transvaginal embryo transfer into the uterus by a thin catheter. The embryos are usually frozen. Dr. Raul Nakano explaining the processes of Egg freezing and their applications.